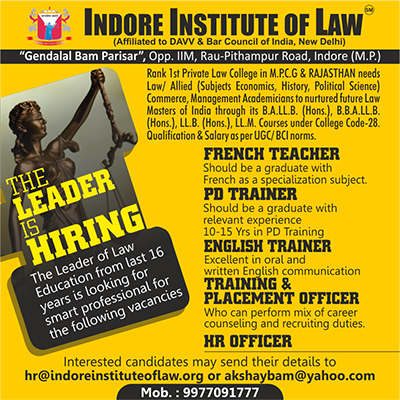 Indore Institute of Law, Indore has advertised in THE TIMES OF INDIA newspaper for recruitment of Professor / Associate Professor / Assistant Professor jobs vacancies. Interested and eligible job aspirants are requested to apply immediately from 05th April 2019. Check out further more details below. About College: IIL was established with the objective of bringing about intellectual awakening and overall development of people of our country through education. IIL is a leading Law school in the country, which has created a history by establishing within a short span of 15 year or so educational institution imparting education from the pre-imparting stage to post graduate stage. Our colleges higher education impart education in different discipline including Law, Nursing, Management & social work.